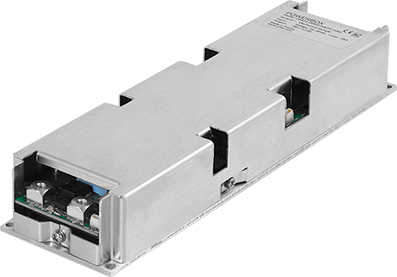 The DAA/B/C Series of rugged DC/DC converters provide wide range of input and output voltages in various power levels from 50W up to 500W. DAA/B/C Series converters are suitable for wide range of applications in electrically and environmentally harsh environments such as demanding industrial, transportation and defense as well as telecom market sectors. Due to the operating temperature range down to -40C and baseplate cooling they are well suited for sealed high IP outdoor and mobile application. Wide variety of input versions are suitable for 12V and 24V automotive vehicles, 48V, 72V and 96V industrial vehicles as well as 28V defense, avionics and marine systems, not forgetting most railway systems from 24V up to 110V. DAA/B/C Series comply with several frequently requested standards such as defense MIL-STD461 EMC, MIL-STD-810 environment, MIL-STD-704 aircraft and any MIL-STD-1275 system, but it is designed also for railway EN50155 and EN50121 EMC, ITE EN55022 EMC as well as general safety according to IEC/EN60950.